Tiger girl is having a new obsession lately. She loves shoes and especially my high heels. Tiger girl is often putting them on and walking around the house in them grinning from cheek to cheek. Sometimes she bursts out shreaking in laughter when I catch her wearing my shoes. 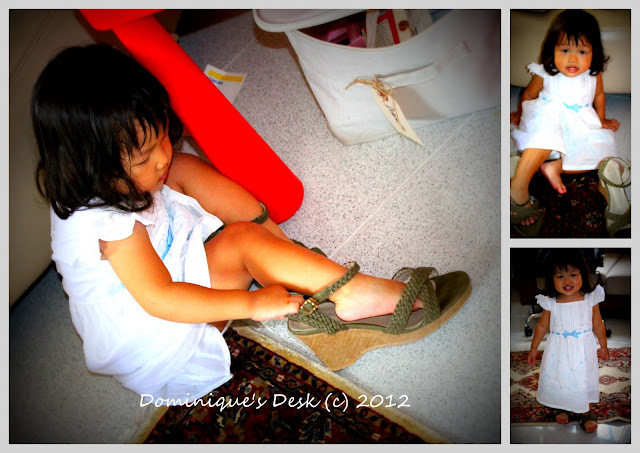 I guess that it is an inborn thing about kids and shoes. I remember her older brothers were the same too at that age. They have an obsession with shoes which are too big for their size. They loved tottering around the house with the over sized shoes making such a din as the shoes go clomp all over the house. Where your kids like this too at this age? My two kids have never had a thing with my shoes. But I do remember pulling on my mum’s high heels when I was young! They look a little big for her. LOL So cute! that is so cute. the white dress is very nice on her too.